After Dan Graham is a mixed reality interactive art installation inspired by Dan Graham’s 1974 video art installation “Time Delay Room 1”. Both a re-creation and homage to Graham’s work, this installation extends his groundbreaking use of video feedback to investigate how technology mediates self-perception. Designed for multiple participants, this installation presents a virtual environment inside a physical environment. 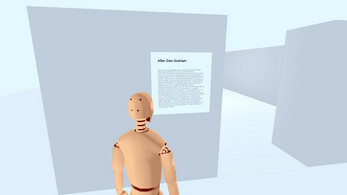 Inside the virtual environment, a single participant is presented with an embodied first-person perspective. The participant’s movement inside the virtual world is recorded and fed back into the system in the form of an endless stream of virtual agents. Participants outside the virtual environment are able to observe events inside the virtual world through a series of screens mounted around the room. In extending Graham’s exploration of data feedback into virtual reality, this work explores how media technology can alter the relationship between subject and object. After Dan Graham is an interactive mixed reality installation designed for multiple participants. The installation takes place inside a single room with white walls which is empty save for four flatscreen monitors, two mounted on one wall and the other two mounted on the opposite wall. A single, wireless virtual reality (VR) head mounted display (HMD) and two VR hand controllers sit on a small plinth in one corner of the room. A single participant is invited to put on the VR HMD and carry the two hand controllers. Inside the virtual environment, the participant is placed inside the body of a featureless humanoid avatar, whose movements correspond directly to the movement of the participant. Looking around, they see a re-creation of Dan Graham’s Time Delay Room 1 (1974). This VR re-creation consists of two identical rooms, connected through a single passageway, with two doorways on either end. Each room is monitored by a video camera which captures the occupants in each room along with two televisions mounted to the opposite wall. One of the monitors features the live feed of the camera capturing the adjacent room while the other monitor features the feed of the camera capturing the current room on an eight-second delay. Next to one of the doorways into the installation is a museum-style didactic describing Graham’s original work. Every eight seconds after the VR experience begins, a new virtual agent spawns in the same location that the participant first appeared.. The virtual agent looks identical to the participant and its movement is based on the movement of the VR participant on a 8 second delay. Over time, the room becomes populated with a crowd of virtual agents, all echoing the movements of the VR participant. Those outside of the virtual environment (not wearing the HMD) are free to move about the installation and observe the four flatscreen monitors. These monitors display the same images as the four monitors inside the VR experience - two show the live feed of the adjacent room (in the virtual environment) and two show the live feed of the current room (in the virtual environment) on an 8-second delay. In addition to observing the monitors, people outside the virtual environment may also observe the participant wearing the VR HMD as they move about the experience. 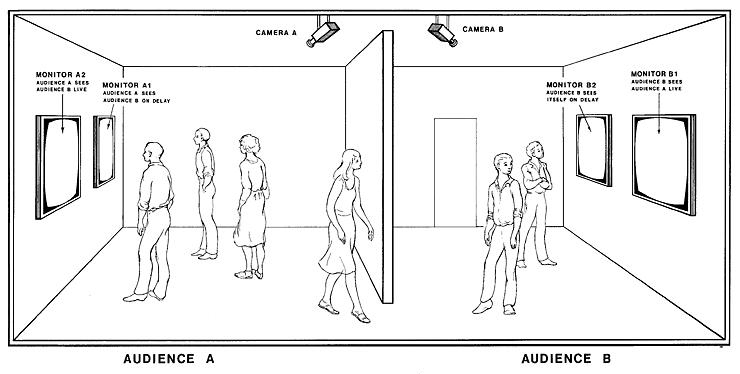 Two rooms of equal size, connected by an opening at one side, under surveillance by two video cameras positioned at the connecting point between the two rooms. The front inside wall of each features two video screens - within the scope of the surveillance cameras. The monitor which the visitor coming out of the other room spies first shows the live behavior of the people in the respective other room. In both rooms, the second screen shows an image of the behavior of the viewers in the respectively other room - but with an eight second delay. The time-lag of eight seconds is the outer limit of the neurophysiological short-term memory that forms an immediate part of our present perception and affects this “from within”. If you see your behavior eight seconds ago presented on a video monitor “from outside” you will probably therefore not recognize the distance in time but tend to identify your current perception and current behavior with the state eight seconds earlier. Since this leads to inconsistent impressions which you then respond to, you get caught up in a feedback loop. You feel trapped in a state of observation, in which your self-observation is subject to some outside visible control. In this manner, you as the viewer experience yourself as part of a social group of observed observers [instead of, as in the traditional view of art, standing arrested in individual contemplation before an auratic object]. Graham argues that the immediacy of video feedback can be utilized to collapse the distinction between subject and object, interior and exterior, private and public. 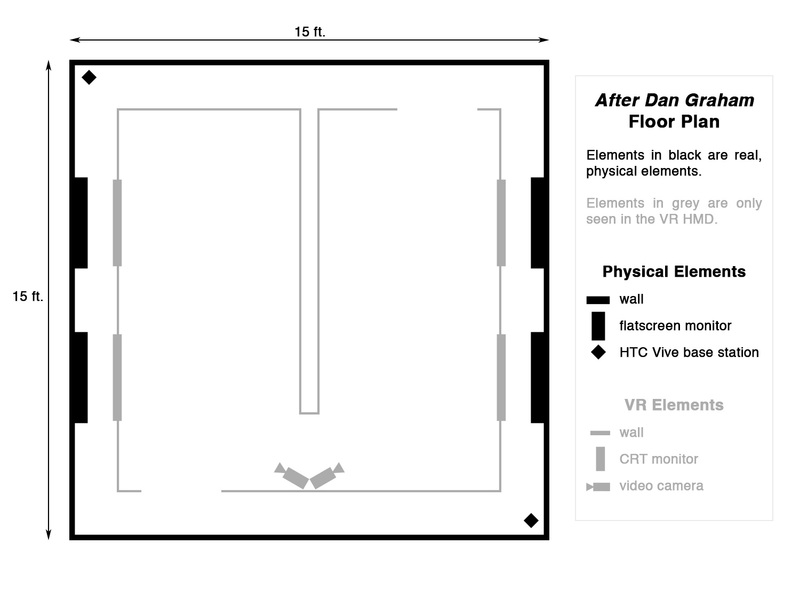 After Dan Graham extends Graham’s use of feedback to VR, a medium in which the apparatus (the HMD and hand controllers) blurs the boundary between observer and subject. By incarnating a participant’s corporeal data in the form of a population of virtual agents, this work expands subjectivity beyond the participant’s virtual body into a multiplicity of exterior, observable bodies. In doing so, this installation links Graham’s experimentation with the then-emerging medium of video to the currently emerging medium of virtual reality. This suggests that the questions concerning embodiment, subjectivity, self, identity, etc. explored by Graham (and his contemporaries like Peter Campus and Vito Acconci) are still relevant, perhaps even more so, given the shift towards an embodied medium like VR. After Dan Graham is a project created by Friend Generator. Friend Generator are Aidan Waite and David Han, two blokes interested in creating strange and playful media art experiences that are sometimes evocative, and sometimes absurd, but are always guaranteed to push boundaries in unexpected ways. While David brings a blend of "jack of all trades, master of none" technical skills, highfalutin media theory and a history of exhibiting large-scale media art installations to the team, Aidan brings some serious game developer chops and gamer cred alongside an ability to spin a frisbee with the best of them and an appreciation for the weird and wonderful. After Dan Graham is their first collaboration. Aidan Waite is a mobile app and game developer who creates novel player experiences through collaboration, experimentation and iteration. He aims to create games by embracing constraints, taking risks, and challenging player assumptions about what constitutes a game. David Han is a media artist, scholar and educator whose work employs emerging technology to explore the boundaries between computation, cinema and immersive media. His current practice employs a formalist approach to explore the unique affordances of virtual reality (VR) and aims to understand and expand the range of possibilities for creative practice in VR. Graham, Dan. Public/Private. Goldie Paley Gallery, Levy Gallery for the Arts in Philadelphia, Moore College of Art and Design, 1993.